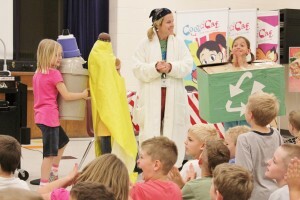 Understanding how to be waste-free is fun! Looking for a unique approach to bring environmental awareness to your students? PLP is here to help! We conduct programs throughout Michigan to help students develop an understanding about individual actions and the impact on the planet. We focus on the simple, eco-friendly solutions that each person can incorporate into his or her daily life. Collectively, we can make a difference! Our goal is to foster responsible choices to achieve long term, positive, behavior change. Through integrated, experiential educational programming, students recognize the relationship between daily living and impacts on our ecology. By focusing on solutions, students are inspired to respect and care for Earth’s resources. Conserving today will result in cleaner, healthier communities for future generations! We offer a variety of engaging, highly participatory programs designed specifically to help kids understand the importance of conserving nature’s resources. Programs are tailored to meet your target audience and are aligned with Michigan Common Core Standards. Check out all of our Kids Environmental Programs for details and pricing.